Stuart Hamblen was born on 20 October, 1908, in Kellyville, Texas. He started singing on the KFI radio station in Los Angeles in 1927 and in 1934 was signed to the newly-formed MCA Records label. His first major success in C&W came in 1949 with the number, "But I'll Be Chasin' Women." 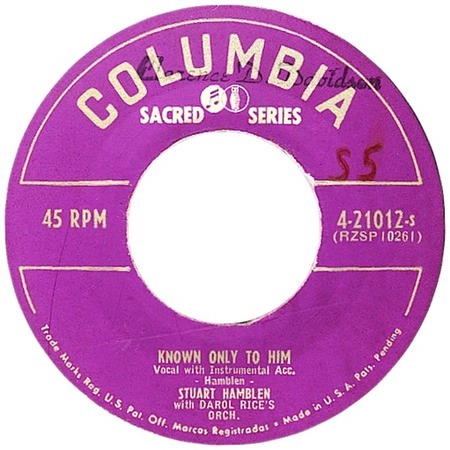 He recorded the original version of his self-penned "Known Only To Him" on 29 July, 1952, and it was released as a single on Columbia Sacred Series 4-21012, being reviewd in Billboard's "This week's New Records" section in the week ending 8 November, 1952. This might indicate a problem, for The Golden Chorus Featuring Jimmy Carroll also recorded Hamblen's "Known Only To Him," and their version, on the 45 rpm RCA Victor 47-4895 (matrix E2VW-6828) was listed in "This Week's New Releases on RCA Victor" with the note, "Ships Coast to Coast, Aug. 24", in Billboard for week ending 23 August 1952 (the recording was also issued on 78rpm RCA Victor 20-5072, though the label here showed matrix E2VB-6828). Could it be that they recorded Hamblen's number before Hamblen himself? Stuart Hamblen wrote a number of gospels, including "It Is No Secret (What God Can Do)," also recorded by Elvis. Stuart Hamblen died on 8 March, 1989. Numerous artists, including The Statesmen, have recorded this gospel favourite. Jake Hess, lead singer with The Statesmen, sang this number at Elvis's funeral.